Woody Allen’s average of releasing a movie a year continues with his 2014 output Magic in the Moonlight. His ratio very often yields positive results more often than not. Unfortunately his latest effort lacks heavily in a few major areas that really brought my attention away from escaping into his newest romantic fantasy. The movie opens up in Berlin, 1928 with an Asian magician on stage performing some elaborate tricks making an elephant disappear and switching his place on stage seemingly via teleportation. Magic seems to be a recurring motif in the Woodman’s pictures more recently with The Curse of the Jade Scorpion (2001) and Scoop (2006). It seems like he is still channeling his inner Fellini with stories dealing with old styles of showmanship as Fellini did with the circus. After these acts are finished we go backstage and see that this performer billed as “Wei Ling Soo” we thought was Chinese was actually British actor Colin Firth under some dramatic make-up and a wig. Firth plays Stanley, a very pompous and cynical magician who views the people that believe his act derives from dark powers and a spiritual world involving a supreme being are fools. He hears from a friend about an American girl (Emma Stone) who has psychic abilities and is persuaded heavily by his friend to come and visit the South of France where this American girl is staying. Firth goes bringing his cynical atheist opinionated ways with him and trouble ensues as he insults everyone who believes she has a true psychic gift from another world and even Firth’s character is challenged to question himself and his adamant philosophies on God and religion. Colin Firth’s performance is one of the very best aspects of Magic in the Moonlight. He plays Stanley with a cocky arrogance and humor that is impossible to despise even though his character should be very easy to dislike. The costumes are also exquisite and really do make you feel like you are watching moments in a time from over eighty years ago. The script also should be commended not for the dialogue but for the way that the narrative unfolds. There are some moments in this film where the audience will be genuinely surprised with a few twists and turns that the movie takes and certain characters motivations. We see the story through Colin Firth’s skeptical eyes and as he is astounded by events in the film, so are we. Eileen Atkins also gives a performance that deserves to be commended as Firth’s Aunt. She is very convincing as his moral compass and surrogate mother. The biggest problem and the factor that makes Magic in the Moonlight ultimately a failure for me was some of the choices in the casting especially Emma Stone as the female lead. Every time she spoke I was convinced I was seeing an actress born in the late 20th century playing a person in the early 20th century. No matter how great the costumes were or the set design her presence in the film took me out of it. She does not have any classic Hollywood qualities or acting capabilities and that really hurt the picture. On top of that, as the plot progresses and a romance is developed Emma Stone seemed even more miscast because she had absolutely zero chemistry with the male lead. This is unusual since Woody Allen is usually very good at casting roles especially for women and even in some of his more lackluster films; chemistry between the leading roles is seldom a problem. She was not the only performance that felt terribly miscast. Hamish Linklater has a major role as a pathetic romantic sap trying to woo Emma Stone by playing a ukulele and singing (albeit very badly) did not have any qualities that convinced me he was alive in 1928. Too many actors in Magic in the Moonlight felt as if they were all Katie Holmes in Batman Begins (2005), actors that are good but just miscast or out of place in this film. The film also dragged at parts. The script was strongest when it was conning Firth and the audience and then revealing moments that were surprising. When the characters were just sitting around and talking about their lives, God, religion and relationships, the dialogue was bland. The scenery was gorgeous but the film as a whole lacked the whimsical escapism that it was striving for. 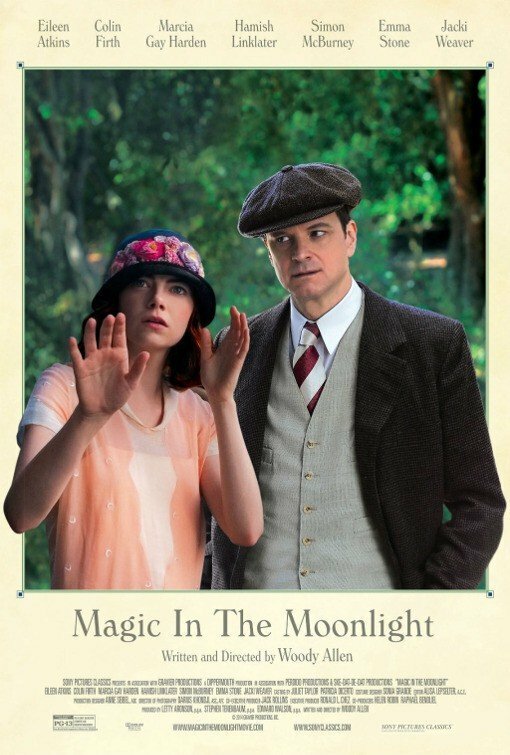 Overall, Magic in the Moonlight was one of Woody Allen’s weaker efforts and is not worth recommending to anyone other than the Woodman’s biggest fans, who will most likely see this movie regardless of what any reviews say. Perhaps if major roles had been recast I would have felt differently, instead the actors could not adequately handle the script and convince me it was actually France in 1928. One of Woody Allen’s more mediocre attempts, it is always reassuring to know that he will have a film released next year with actors cast more appropriately.